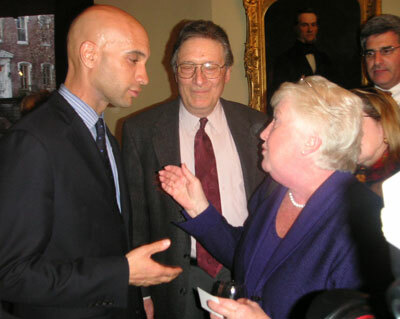 MAY 2007 - The Mayor of Washington D.C., Adrian M. Fenty, was recently honored by the Italian American community at a private gathering hosted by the National Italian American Foundation and held at the elegant Georgetown home of Dr. James D’Orta, a medical doctor and founder and chief executive officer of Consumer Health Services. By many accounts, the star attraction of the evening was the Mayor’s mother, Jeanette Bianchi Perno Fenty, whose family hails from Monte San Giovanni Campano, a small town located about 90 km southeast of Rome and about 14 km east of Frosinone in the region of Lazio. Her family emigrated to the United States in 1920. Mrs. Fenty and her husband, Phil Fenty (a native of Buffalo, N.Y., whose roots are traced to Barbados and Panama) moved to Washington in 1967. The city’s future mayor was born in the District three years later. Mayor Fenty was raised in the Mount Pleasant neighborhood. He earned a Bachelor of Arts degree from Oberlin College and holds a Juris Doctorate from the Howard University School of Law. Fenty began his electoral career on the Washington, D.C. Council in 2001, winning a hard-fought battle against four-term incumbent Charlene Drew Jarvis. Fenty was elected Washington’s youngest-ever mayor in November 2006, carrying every precinct in the city in both the primary and the general elections. He lives with his wife Michelle, a corporate attorney, and their twin sons, Matthew and Andrew, in the Crestwood section of Northwest Washington, D.C. 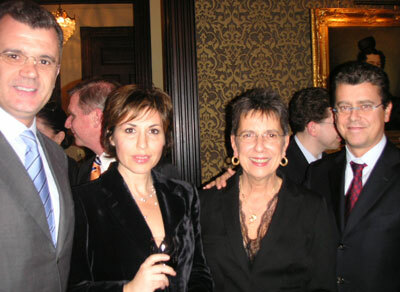 Among those attending the event were Dan Tangherlini, city administrator and deputy Mayor, NIAF president Kenneth Ciongoli, and executive director, John Salamone, Dana Gioia, chairman of the National Endowment for the Arts, Voce Italiana trustees, Beatrice Tierney and Stephanie Razzano, representatives from the Italian Embassy in Washington, and other prominent Italian American business and community leaders.